This device is almost the same as Release 1.5. For high-speed USB, there is a Release 1.7. If 3.3V operation of ATmega is wanted, a user can now populate a dual diode BAV199 instead of the LD1117 of the previous version. This enables drawing less than 500 µA of standby current in this case. The firmware from december 2010 to february 2012 is not compatible to Windows Vista and Windows 7 (32 and 64 bit) – please update! It's not hard to populate this PCB. For Windows driver and AVR firmware, see page above, and how-to-use instructions. Here you can browse the firmware source in your web browser. The current USB2LPT Low-Speed (1.6) firmware implementation has many ways for I/O transaction. However, the driver (usb2lpt.sys) preferes only one, the oldest and still fastest way, using two BULK pipes. One BULK OUT for addresses and output (write) data, another BULK IN for input (read) data. Refer to DeviceIoControl() based API for understanding. The very simple and low-performance EP0 based for one Linux user (Henning Paul). Contrary to all other interfaces, it has no ECP/EPP support at all. I never used this interface. The INTERRUPT OUT + IN alternative for Linux, Vista, Win7 to conform to USB standard which forbids BULK for low-speed USB devices. 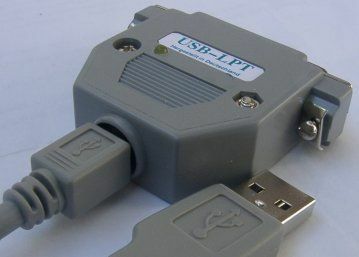 (USB2LPT was developed for full-speed AN2313 controller.) The device is preconfigured to use INTERRUPT instead of BULK. This works on all known systems but is at least 8 times slower than BULK. Activating BULK will remove that slowdown but will render the entire device as defective in Windows Vista, 7, 8, and newer, and Linux. The usb2lpt.sys driver supports both BULK and INTERRUPT pipes. The advanced EP0 based as a faster alternative to INTERRUPT pipes. The driver currently doesn't use this way, but it's planned. The HID (Human Interface Device) way to overcome the driver certification trouble on Win64 systems. The driver cannot use this way because Windows loads its generic HID driver for this interface (that omits certification hassle). 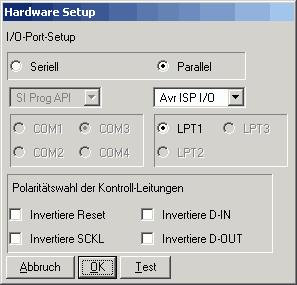 This interface is for USB2LPT-adopted inpout32.dll and similar port access libraries. Note that most parallel port accessing software will not run on 64 bit systems, even with a true parallel port. In such cases, requiring to use InpOut32.dll is not a limitation. Do not twiddle with the fuses without knowledge! You may make the ATmega unaccessible to PonyProg and all other low-voltage serial programmers! Programming adapter used in correct direction? Solder jumper SJ2 (still) connected? Pins of SubD25 socket soldered correctly? Cycle power to USB2LPT, let install driver usb2lpt.inf. The Bootloader ( HIDboot) will not occur because the .hex file above contains both bootloader and the real USB2LPT firmware. Solder joints on USB socket correctly? SMD solder joints correctly without shorts? Check with another computer and/or with front-side or back-side USB connectors on PC, or using a USB hub. If USB2LPT seems to work unreliable, populating the crystal and downgrading to USB2LPT 1.5 firmware may help. The reason is an unstable 5V supply, that jitters the internal RC oscillator of the 1.6 firmware solution. Alternatively, download fw-utils.en.zip first for English message utilities (it's not supported by me). Population with ATmegaX8 is currently not recommended. 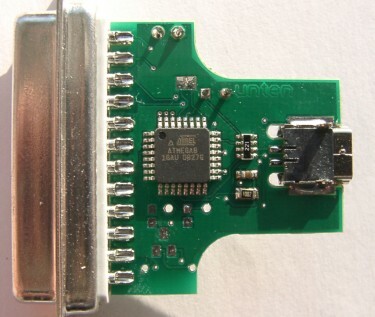 The 5 V USB interface with 220 Ω series resistors is incompatible to some notebooks. In such a case, the device will not be recognized correctly, and you see „Unknown device“. No driver installation will help here, and any force may damage your Windows installation. Use a USB hub in between, or an active extension cable (which is essentially a one-port hub). Change components to 3.3 V design, i.e. populate the BAV199 as stated above. Of course, this will result in 3.3 V I/O voltages, and the inputs are then not truly 5.0 V compliant. 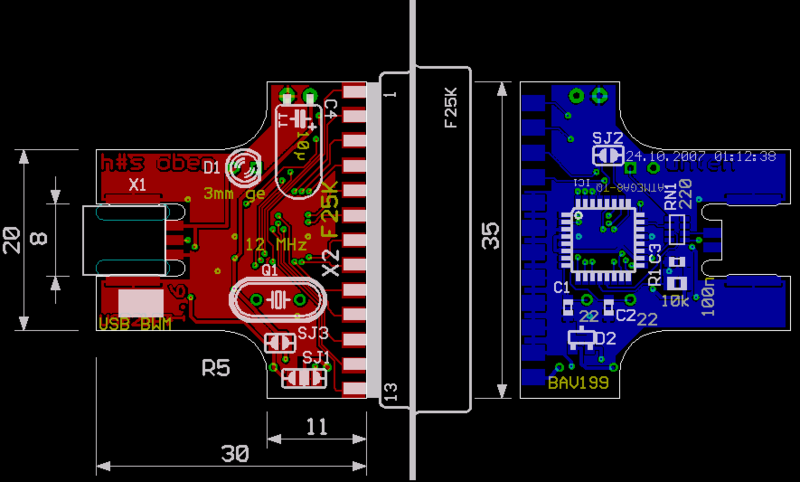 Populate flying 3.9 V zener diodes to USB D+ and D- wires. If power is needed, populating a self-resetting fuse is highly recommended. 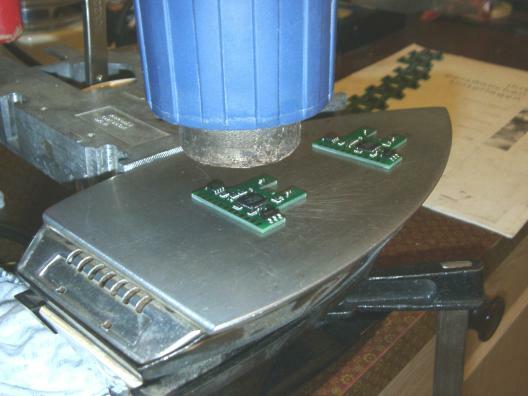 SJ2, connected at PCB fabrication, scratched at device manufacturing: activates the RESET pin of ATmega for programming the microcontroller. 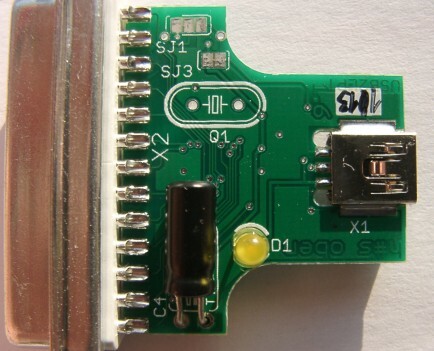 SJ3, connected by default, scratch when you want 3.3 volts operation of ATmega8 (e.g. for safer JTAG connection), populate a BAV199 and change R1. Moreover, scatch it to measure device's current consumption and re-solder.